As I've described in several previous posts, self hosting SignalR is very straight forward to set up. It's easy enough to do, which is great if you need to hook SignalR as an event source to standard Windows based application such as a Service or even a WPF or Winforms desktop application that needs to send push notifications to many users. One aspect of self-hosting that's not quite so transparent or documented though, is running a self hosted SignalR service under SSL. The Windows certificate store and creation, configuration and installation of certificates is still a pain as there's no UI in Windows that provides linking endpoints to certificates and the process is not very well documented end to end. It's easy enough once you know what command line tool you need to call, but this process certainly could be a little smoother and better documented. Hence I'm rehashing this topic here to provide a little more detail and hopefully a more coherent description of setting up a certificate for self-hosting an OWIN service in general and specifically for SignalR. When you're self hosting SignalR you're essentially using the hosting services provided by OWIN/Katana. OWIN is a low level spec that for implementing custom hosting providers that can be used interchangeably. The idea is to decouple the hosting process from a specific implementation and make it pluggable, so you can choose your hosting implementations. Self hosting under HttpListener is wonderful and completely self-contained, but one of the downsides of not being part of IIS is that it also doesn't know about certificates that are installed for IIS, which means that certificates you want to use have to be explicitly bound to a port. Note that you can use IIS certificates and if you need to acquire a full certificate for use with a self-hosted application, going through the IIS certificate process is the easiest way to get the certificate loaded. If you need a certificate for local testing too IIS's self-signed certificate creation tool makes that very easy as well (I'll describe that below). If IIS is installed the former is the easiest. Here you can easily see all installed certificates and this UI is also the easiest way to create local self-signed certificates. Unfortunately neither of these places makes it easy to copy the hash, so you either have to copy it manually or remove the spaces from the thumbprint data in the dialog. If you don't have a full server certificate yet, but you'd like to test with SSL operations locally you can also use the IIS Admin interface to very easily create a self-signed certificate. 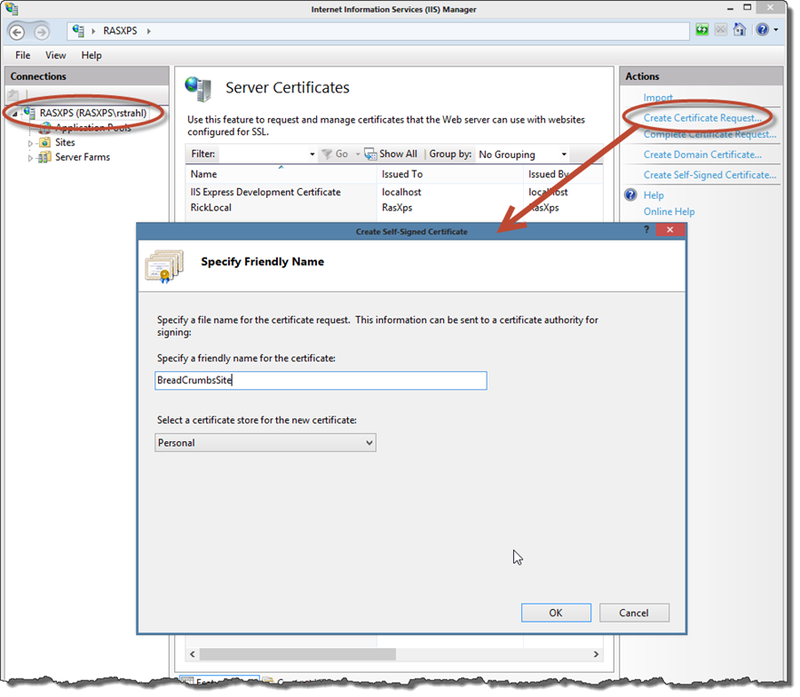 The IIS Management console provides one of the easiest ways to create a local self-signed certificate. That's all there is to create the self-signed local certificate. Once you have a self-signed certificate, you need one more step to make the certificate trusted, so Http clients will accept it on your machine without certificate errors. The process involves copying the certificate from the personal store to the trusted machine store. You should now have a certificate that browsers will trust. This works fine for IE, Chrome and Safari, but FireFox will need some special steps (thanks to Eric Lawrence) and Opera also requires specific registration of certificates. Self signed certificates are great for testing under SSL to make sure your application works, but it's not so nice for production apps as the certificate would have to be installed on any machine you'd expect to trust this certificate which is a hassle. Once you go to production, especially public production you'll need an 'official' certificate signed by a one of the global certificate authorities for $$$ (or these days LetsEncrypt). 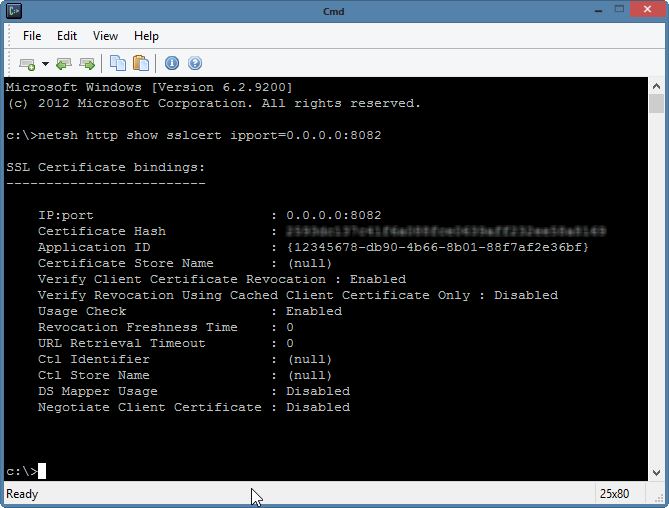 The easiest way to do this is to purchase or generate a full IIS certificate and install it in IIS. The IIS certificate can also be used for self-hosted applications using the HttpListener so it will work just fine with a self-hosted SignalR or any HttpListener application. So once the time comes to go live, register a new certificate through IIS, then use netsh http add sslcert to register that certificate as shown above. A public SSL certificate in most cases is already recognized so no further certificate store moving is required - all you need is the netsh registration to tie it to a particular port and app Id. This binds SignalR to the all ip addresses on port 8082. You can also specify a specific IP address, but using * is more portable especially if you set the value as part of a shared configuration file. If you recall from my last self-hosting post, OWIN uses a startup class (SignalRStartup in this case) to handle OWIN and SignalR HubConfiguration, but the only thing that needs to change is the startup URL and your self-hosted server is ready to go. where RasXps here is my exact local machine name that has the certificate registered to it. As with all certificates make sure that the domain name matches the certificate's name exactly. For local machines that means don't use localhost if the certificate is assigned to your local machines NetBios name as it is by default. Don't use your IP address either - use whatever the certificate is assigned to. $.connection.hub.url = self.hubUrl; // ie. "[https://rasxps:8082/signalR](https://rasxps:8082/signalR);"
From a code perspective other than the two small URL code changes there isn't anything that changes for SSL operation, which is nice. SSL usage is becoming ever more important as more and more application require transport security. Even if your self-hosted SignalR application doesn't explicitly require SSL, if the SignalR client is hosted inside of a Web page that's running SSL you have to run SignalR under SSL, if you want it to work without browser error messages or failures under some browsers that will reject mixed content on SSL pages. SSL configuration is always a drag, as it's not intuitive and requires a bit of research. It'd be nice if the HttpListener certificate configuration would be as easy as IIS configuration is today or better yet, if self-hosted apps could just use already installed IIS certificates. Unfortunately it's not quite that easy and you do need to run a command line utility with some magic ID associated with it. 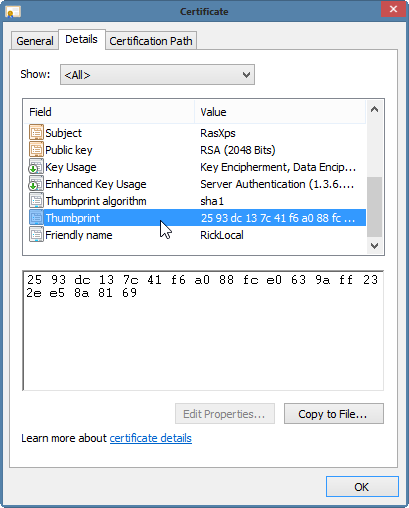 One thing to beware of though - when copying the thumbprint from Certificate Manager in the details window, it appears that a hidden character gets copied at the start. You can check this by using the cursor to move through it - delete it if it's there! Leaving it in caused the "The Parameter is Incorrect" message for me, when the command on the command prompt *looked* correct. This was at least the case for me on Windows 8 and Server 2012. Here is a great tool that I stumbled upon by Rafaele (http://www.iamraf.net/) for handeling certificates and getting the thumbprint without clutter. Thanks for the great writeup. Following the directions, I was able to get SignalR to work under HTTPS. Is it possible to have SignalR handle both HTTPS and HTTP under the same service, under the startup factory invocation ? Thanks. Irpham - yes you can - just run WebApp.Start() multiple times for each of the URLs involved. This creates separate service hosts, but they all use the same static SignalR components. The only thing that changed recently was the connection string to the database server. Have you run into this problem with HTTPS ? Thanks. Is there a way to tell SignalR to not worry about self signed certificates? Thanks to Richard L! I hit the "The Parameter is Incorrect" problem. It would have taken ages to figure out that hidden character issue. I used this guide to make a local self-hosted SignalR app to work with some of our in-house web applications that use SSL. It was working until corporate pushed through regedits that require browsers to use the TLS 1.2 protocol. After this change, the browser throws an unsupported SSL version error when the browser tries to connect to the app's SignalR hub. So is there any way to specify which SSL protocol that the self-hosted SignalR app uses? @Kevin - You have to make sure you use a TLS 1.2 certificate on the server. There's no way to control 'which version' is served - the cert supports a certain level of SSL/TLS and that's what you get. If you need to support the newer type you need to install a TLS 1.2 cert on the server. I have developed a portable, self hosted windows service(SignalR), by portable i mean that any user who wants to communicate/upload the data to my web app should install this service on their local system. There was no problem communicating over HTTP. I followed all the steps provided in this blog to make it work over HTTPS. It works fine when the windows service and the web application are hosted from the same system. But it fails to communicate over HTTPS(using self signed certificate) when the service is hosted from a different machine and throws up error ERR_INSECURE_RESPONSE, though i could notice that the signalR proxy is generated. What kind of SSL certificate do i have to create to distribute to multiple clients to communicate. How do i register the SSL certificate in local system and communicate over it. Any pointers over this will be of great help. @Junaid - if you create a self-signed certificate that certificate is valid only on the machine that you created it on - unless you register that certificate on other machines. You can do that by installing the certificate on remote machines as shown in the Copy Certificate to Trusted Root section in the post above. You can do the same on other machines that you want to trust. Had same issue as Richard L and used their solution. Excellent comment Richard. Hi thanks for a great article.. I wonder if anyone has an input on doing this from app.config only. I use "Lets encrypt" certificates (valid 3 month and i autorenew) I dont want to "netsh" with new thumbprint, every 3 month. I want to find the cert in store by name and use it in my windows service. Hi Rick, Thanks for great post. I have developed SignalR HttpListener based host. My web application communicates with this SignalR host installed on local machine. It works fine with HTTP. when i open SignalR proxy on browser tab and add it in Exception List(Security Exception) of browser, it connect with signalR host, but browser turns from secure site to Not Secure site. How can i resolve this Not Secure error comes in browser address bar? How can i make it working without adding in security exception list of browser? If i want to use SignalR host on 100 computers, Is there any easy way i can install certificate on hundred of computers? Do i have to buy SSL certificate issued to local HostName from Certificate autority? If yes, single wildcard certificate can work for all 100 computers? OR i will have to buy for each computers seperately? Please guide. If my IIS is using the valid certificate and I want to apply the same certificate to a self-hosted SignalR I have no problem? 4 years on and this article still seems relevant today. We're struggling with an HTTPS setup for SignalR, but not for the obvious reasons. We seem to have an issue that only occurs when there's an HTTPS binding and reliably disappears when we remove the HTTPS binding and use HTTP only. However, we have had the same code working fine on HTTPS and sometimes it seems to be okay... Due to a recent bunch of tests (swapping in/out various bindings), we are convinced it's something to do with our code on an HTTPS setup, but the fact it works sometimes on HTTPS is really frustrating! I'm currently thinking it has to be that we're not making enough attempts to restart the connection on disconnect, but any advice would be welcome. Many thanks! Hi Rick, thanks for the solution. When I started with SignalR you blog helped a lot and it still does. Could you please help and guide. Thanks...got it sorted. It was the MyUri portion I used at the end of my netsh command. Once I removed that it all worked fine. Thanks again for your blog it is a real reference when getting stuck. Thanks Rick for the great article. Could you please give inputs on implementing browser client side certificate verification. I mean, two way certificate verification. The strange thing is, I get the exception only in my .net client using SSL. The same implementation is working like a charm in .net without SSL or in a web client with SSL. I meant to revisit this a while ago. In response to my TLS question: when Big Brother pushed the SChannel regedits to our machines, they didn't set the "DisabledByDefault" key to "0" for TLS 1.2. For machines running Windows 7, TLS 1.2 is installed, but disabled, so it is necessary to set this key value as per Microsoft's instruction. As soon as I added it manually and restarted, everything worked no problem. As the post says: "The AppId is a hardcoded value that never changes". I presume it's specific to HttpHandler. I am really not clear on what is wrong here.